Your internet line carries multiple signals simultaneously and likewise a gene carries multiple biological signals. A gene does not merely code for a protein. As difficult as it would be to randomly find a protein-coding gene sequence, it would be much more difficult to find a real gene because they carry so many more signals. For instance, the gene’s DNA sequence determines the important stability of the DNA copy—the so-called mRNA strand, and the mRNA interactions with proteins such as editing machinery. The gene sequence also determines the protein’s three-dimensional protein structure, the stability of that structure, the function of the protein, interactions of the protein with other proteins, instructions for transport, and so forth. The gene sequence specifies the amino acids to be used in making the new protein. But for many of the twenty amino acids there are several codes available. These “codes” are three-letter nucleotides in the gene sequence, called codons. 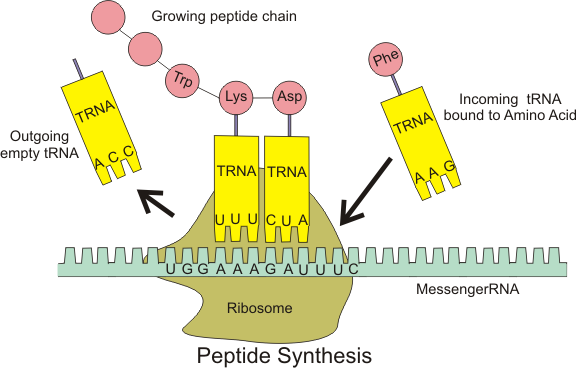 The codons attract different amino acid carrying machines (called tRNAs) which have the corresponding amino acid attached on their other side. It has long been known that the different tRNAs that carry a common particular amino acid are not all equal. They may have different abundances in the cell, and the gene sequences do not use them all equally. This may depend, for instance, on how often the gene is used. But new research has now found yet another distinguishing factor between the different synonymous tRNAs: they don’t all work equally well under different environmental conditions. Specifically, when the supply of amino acids is low, some tRNAs continue to be loaded with its amino acid, but other tRNAs fail to be loaded. This means the way a DNA gene sequence chooses between the different synonymous tRNAs may influence whether it successfully produces a protein, in different conditions. For instance, perhaps some proteins should have lower priority than other proteins, in certain conditions. That could be coded for in the way their respective gene sequences use the synonymous tRNAs. It could be yet another layer of information coded for by gene sequences. Excerpt: Nucleotide sequences carry genetic information of many different kinds, not just instructions for protein synthesis (triplet code). Here, we show that the universal genetic code can efficiently carry arbitrary parallel codes much better than the vast majority of other possible genetic codes.... the present findings support the view that protein-coding regions can carry abundant parallel codes. Excerpt: According to Garrett and Grisham's Biochemistry, the aminoacyl tRNA snythetase is a "second genetic code" because it must discriminate among each of the twenty amino acids and then call out the proper tRNA for that amino acid: "Although the primary genetic code is key to understanding the central dogma of molecular biology on how DNA encodes proteins, the second genetic code is just as crucial to the fidelity of information transfer." Excerpt: Researchers recognize several advantages to DNA computers. (7) One is the ability to perform a massive number of operations at the same time (in parallel) as opposed to one at a time (serially) as demanded by silicon-based computers. Secondly, DNA has the capacity to store an enormous quantity of information. One gram of DNA can house as much information as nearly 1 trillion CDs. And a third benefit is that DNA computing operates near the theoretical capacity with regard to energy efficiency. Excerpt: Here we report evidence that three-quarters of the human genome is capable of being transcribed, as well as observations about the range and levels of expression, localization, processing fates, regulatory regions and modifications of almost all currently annotated and thousands of previously unannotated RNAs. These observations, taken together, prompt a redefinition of the concept of a gene. Excerpt: A new type of DNA sequencing technology has been developed and used to identify and characterize key regions of the genome called “enhancer” sequences.1 These are novel DNA features that were once thought to be a part of the so-called “junk DNA” regions of the genome. These key elements are now proven to be part of the indispensable and irreducibly complex design inherent to proper gene function for all types and categories of genes. Dr.Hunter: "This means the way a DNA gene sequence chooses between the different synonymous tRNAs may influence whether it successfully produces a protein, in different conditions." Dr. Hunter, some hold the digital coding schema - linking DNA as Master Cause, to RNA as precisely programmed mediary, to protein as definitive final result - as being hopelessly outmoded. Harvard biologist Richard Lewontin once wrote, DNA is “a dead molecule, among the most nonreactive, chemically inert molecules in the living world". Some argue that organisms must be understood and explained at least in part from above downward, from context to subcontext, from the general laws or character of their being to the never-fully-independent details. Dr. Hunter what is your position? Well there is still much to learn about how all this works, but the science does seem to indicate that evolution's strong focus on DNA (eg, genotype determines phenotype) is inadequate. Amazing. And evolutionists want us to believe that all this super-complicated machinery just happened to arise from random forces. How absurd. Perhaps Jeffrey Shallit could explain how random events produced all this. They will tell you it was the magic of natural selection that didit. Natural selection is their magical ratchet. Joe, they will tell us RM & NS didit. Always both and never one or the other. The problem is of course with RM, and NS is just something that's there but as you rightly point out doesn't do much of anything to help the process. Isn't that just "mere complexity"? Not necessarily. 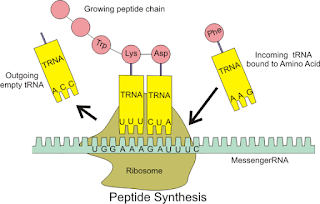 One of the main reasons why genetic engineering hasn't been all that successful is that some transplanted genes produced polypeptides but those did NOT form a protein, ie they did NOT take shape. Dr Sermonti talks about this in "Why is a Fly Not a Horse?" Then we have many proteins that require chaperones in order to fold and find their shape. It is amazing how people who are so wrong can make so many interesting findings and have no clue what they really mean. Evolutionists use the Neutral Theory (which is really an almost complete refutation of Darwinism) as an "ace up their sleeve." But all of these types of constraint demonstrate just how limited "neutrality" is as a concept. Kimura, the author of the NT, was led to it by necessity, not choice. But dreamers like their dreams. So, Darwinists, dream on. When I bring up population genetic models to refute your claim that there must have been an "original pair" of humans, you just wave your hands. But when it suits your creationist purposes, you love to bring up the population genetic models of Kimura. Don't they call that having your cake and eating it too? In a design scenario, population genetics, which rely on blind watchmaker evolution, do not apply. Well, what's another layer of information when we already have so many? They just sit back in awe and say "Gawd did it!" But, for the Darwinist, evolution is capable of producing anything so 1, 2, even 10 more layers of information won't phase them. It's not about the evidence; it's about their commitment to materialism that forces them to ratchet up their faith every time new complexity is found. Dobzhansky should have said: "Nothing in evolution makes sense period." Or "... except in light of faith." or "... in light of theory." Nothing about Intelligent Design/Creationism make sense in the light of day? No, nothing any evoTARD makes any sense on any day. V: It is amazing how people who are so wrong can make so many interesting findings and have no clue what they really mean. J: It's no more amazing than any other concurrent existence of extreme cognitive weakness with extreme cognitive strength. Great musicians can be quite bad at other kinds of cognitive processing, e.g. True,except in this case 99% of the musicians would have to be bad at exactly the same kind of cognitive processing. It also assumes that those who are so sure they are wrong are actually good at the correct cognitive processing. Why do people continually use this '99%' nonsense? I would agree the vast majority of those involved in the sciences believe in evolution, but it is not 99%. In fact there is no way of knowing what the number actually is as many who support it publicly, are not so supportive in reality. A good point, how about an overwhelming majority? V: True,except in this case 99% of the musicians would have to be bad at exactly the same kind of cognitive processing. J: That wouldn't be surprising either if they were brain-washed about it from kindergarten up, as they are about the OVER-WHELMING evidence for naturalistic UCA. V: It also assumes that those who are so sure they are wrong are actually good at the correct cognitive processing. J: Not sure who you're talking about there. Who's "so sure they are wrong?" According to this 2009 poll the percentage of scientists who accept that evolution occurred is 97%, with 87% attributing it to natural processes and 10% attributing it to either God directed evolution or unknown causes. But of course all those scientists are either liars or frauds for rejecting DA DESIGNER POOFED IT! Just ask Herr Goebbels here. TWT: "How do you know that?" I've met many of them. "A good point, how about an overwhelming majority?" Vast majority isn't good enough? Besides overwhelming majorities are no guarantee of victory, just ask the French at Agincourt, or the Zulus at Roarke's Drift. "But of course all those scientists are either liars or frauds for rejecting DA DESIGNER POOFED IT!" I'm only going to spend a few minutes here before going to watch my Leafs play the Penguins. I like to PVR the games and then skip the commercials. I never implied they were liars. They are however, predisposed to the 'fact' of evolution and thus interpret all evidence in that light. Predisposition does not mean they are correct, nor does the fact they are the vast majority. I never implied they were liars. They are however, predisposed to the 'fact' of evolution and thus interpret all evidence in that light. Why shouldn't they be predisposed when all the available evidence for the last 150 years supports the idea? Geologists are 'predisposed' to accept plate tectonics and interpret all geological evidence in that light. Astronomers are 'predisposed' to accept gravity and interpret galaxy formation in that light. Why aren't you harping at them? True, but sooner or later you need to take an honest look at why 97% of all professionals in science, those who study and work with the evidence on a daily basis, accept that evolution over deep time has occurred. That's millions of knowledgeable individuals all over the globe. Claiming that they're all delusional or misinformed is really just fooling yourself. "I've met many of them." How many is "many"? Name them. "Predisposition does not mean they are correct, nor does the fact they are the vast majority." Apply that to predisposed religious beliefs in general, and to christianity in particular. True, but sooner or later you need to take an honest look at why 97% of all professionals in science, those who study and work with the evidence on a daily basis, accept that evolution over deep time has occurred. What type of "evolution", what did it do and how do they know? Throwing deep time at the issue is NOT science. And hiding behind deep time is cowardice. We know Chubs. You think the world is only 6000 years old, all the 'kinds' were specially created, pairs of each 'kind' rode out Da Flood on the Ark. Go have another donut Chubs. This science stuff only confuses you. Nope. I see that, like the coward you are, you need to lie to make yourself feel big. But I understand that you are still upset because you are a coward and a loser. This science stuff only confuses you. You don't know what science is, and it shows. "How many is "many"? Name them." You're a rather peculiar character. You like to come across as a very highly informed individual, but in reality your attitude comes across as that of a punk. You think you can hurl insults and issue demands and everyone should jump. I can't give you numbers because I don't keep track. Suffice it to say that over the last thirty or so years it would number in the hundreds. As for giving you names, why would I do that and why would you want them? Do you seriously think you would know all those people? If you wish to believe that these people do not exist, that's your prerogative. Delusional thinking is a trademark of evolutionary thought. "Why shouldn't they be predisposed when all the available evidence for the last 150 years supports the idea?" The evidence supports the idea because of their predisposition to interpreting the data in that manner. Data is open to interpretation based on ones presuppositions. Your presupposition is that evolution is true and therefore you simply accept that all evidence points towards it. I don't presume evolution as true and therefore, I don't accept that all evidence is evidence for evolution. "True, but sooner or later you need to take an honest look at why 97% of all professionals in science, those who study and work with the evidence on a daily basis, accept that evolution over deep time has occurred." Well we're making progress, now we're down to 97%. Still to high, but heading in the right direction. Why do you think that because a very large percentage of scientists are predisposed to evolution that evolution is therefore true? The vast majority of today's scientists have throughout their entire education been told evolution is a fact. As a result I would be surprised if the vast majority didn't believe evolution to be true. However, these numbers are meaningless in determining whether or not evolution is indeed true. You could have every person on the planet convinced of evolution's truth, but that would not make it in fact true. If everyone on Earth was to believe the Sun revolved around the Earth, would the Sun then begin to revolve around the Earth? Truth is its own defence regardless of popular opinion. "That's millions of knowledgeable individuals all over the globe. Claiming that they're all delusional or misinformed is really just fooling yourself." No one is saying they are delusional or misinformed. I have only claimed they are predisposed to interpreting the evidence in light of their presuppositions. As for plate tectonics, that is an observable and measurable phenomenon which has really nothing to do with evolutionary theory. Plate tectonics is not a problem within a design scenario. Nic, you keep claiming this but it's flat out not true. In fact. it's 180 degrees wrong. Science in the 1800's didn't start out with the presupposition that evolution was true and then interpret the data to fit. Scientists actually started out with the presupposition that Special Creation was true, then were faced with the problem that the data didn't fit the SC narrative. Evolution was a theory that was developed from the data, not the other way round. The same is true today. New data isn't automatically assumed to fit the ToE paradigm. It is examined independently to see if it fits, and so far everything has. The data drives the interpretation, not the other way around. The vast majority of today's scientists have throughout their entire education been told evolution is a fact. They've also observed its effect firsthand in the lab and in the field. It's not 'indoctrination' as Creationists are fond of claiming, it's an explanation that fits the empirical evidence. As for plate tectonics, that is an observable and measurable phenomenon which has really nothing to do with evolutionary theory. Evolutionary processes are observable and measurable phenomena too. And just like plate tectonics, the effects of evolutionary processes operating over deep time provide a solid consilient explanation for the observed data. Plate tectonics is not a problem within a design scenario. That's why ID isn't scientific. There is no conceivable observation that is a problem for an omnipotent Designer, so ID isn't falsifiable. Keep fooling yourself all you want Nic. Keep repeating the Creationist mantra of "same evidence different interpretation". It won't change scientific consensus one iota, and it won't make the evidence for evolution over deep time go away. And yet IDists have said exactly what would falsify ID. thortty boo-boo- biggest liar ever. IDCers lie about most everything Chubs. We're used to it. Your supposed falsification doesn't work because you can never disprove a powerful enough Designer who is just manipulating physical processes to make it seem like natural evolution. Just like you can't disprove that invisible gravity pixies cause the effects of gravity. You can't prove a negative Chubs, and you can't falsify IDC. That's why it isn't science. No thorton, YOU lie about everything. That has been proven time and again. And just because you are ignorant of science doesn't mean ID cannot be falsified. "Nic, you keep claiming this but it's flat out not true. In fact. it's 180 degrees wrong. Science in the 1800's didn't start out with the presupposition that evolution was true and then interpret the data to fit." Nonsense. The concept of evolution had been around for centuries before Darwin. It rose to prominence in the 19th century with the growth of humanistic and atheistic philosophy which demanded an origins explanation which did away with the concept of a supreme being. So yes, the evidence had to be reinterpreted to fit a naturalistic view. Take a little time off from science and do a little reading in history and sociology. Trust me, it will help. "Scientists actually started out with the presupposition that Special Creation was true, then were faced with the problem that the data didn't fit the SC narrative. Evolution was a theory that was developed from the data, not the other way round." All scientific viewpoints start out with some form of presupposition. As for data not fitting the SC narrative, it seems to fit quite well with a fair number of scientists today. Granted, a small number, but qualified scientists nonetheless. Evolution most certainly is a philosophy to which the data is fitted. "The same is true today. New data isn't automatically assumed to fit the ToE paradigm." Would you care to provide for us, from a paper supporting evolution, an abstract which does not affirm evolution from the outset. I've never seen one. So yes, new data is automatically assumed to fit the evolutionary paradigm. "It is examined independently to see if it fits, and so far everything has." That's very convenient isn't it? "They've also observed its effect firsthand in the lab and in the field." In what way? And remember you've already tried such things as animal husbandry, Lenski, ring species, etc., and you've missed the net every time. "it's an explanation that fits the empirical evidence." An explanation which fits is not necessarily de facto the explanation. "Keep fooling yourself all you want Nic. Keep repeating the Creationist mantra of "same evidence different interpretation". It won't change scientific consensus one iota,..."
I've got to give you an A for effort, Thorton. You keep trying to present your argument but it invariably comes around to the old 'vast majority of scientists believe it, therefore it must be true' fallacy. Sigh...I've never once said that, never once argued that. Not very nice of you to so badly misrepresent what was presented. I guess it's all part of the "keep fooling yourself" routine. The simple fact is you're so deeply in denial that no evidence I present (and I can present a metric boatload) will ever get you to remove your Biblical blinders. Just for grins, why don't you tell me what realistic data would count as positive evidence for evolution in your eyes. Don't give me the BS "list every mutation that ever happen in order" either. I can show you any number transitional fossil sequences. I can show you countless megabytes of genetic data. I can show you thousands of scientific papers with the details of evolutionary processes, and empirical evidence of them working. I can easily think of things that if found would convince me Special Creation 6000 years ago is true. What would convince you that evolution over 3+ billion years is true? "Sigh...I've never once said that, never once argued that." Yes, you have, repeatedly. Following are two examples from this thread alone. Thorton: "It won't change scientific consensus one iota,"
Thorton: "but sooner or later you need to take an honest look at why 97% of all professionals in science, those who study and work with the evidence on a daily basis, accept that evolution over deep time has occurred." "and I can present a metric boatload,..."
"I can show you any number transitional fossil sequences." Neither you, nor anyone else, can conclusively prove any fossil is a 'transitional' fossil. It simply cannot be done. You're dealing with history which was not observed and cannot be repeated. Transitional fossils are 'transitional' only because they have been labeled as such. You can in no way demonstrate that any fossil is anything more than a creature which at some time existed and now no longer exists. You cannot show that it transitioned anywhere. You may not like that fact, but it's a fact nonetheless. "I can show you countless megabytes of genetic data." And this data is interpreted by every geneticist in the world in the way that you accept? "I can show you thousands of scientific papers with the details of evolutionary processes,..."
This is simply another example of 'the vast majority of scientists,...' How about the papers written by scientists who do not accept evolution, do they not count for anything? And by the way, make that three examples. "I can easily think of things that if found would convince me Special Creation 6000 years ago is true." And what would those be? And please, don't say pre-cambrian rabbits. "What would convince you that evolution over 3+ billion years is true?" Demonstrable, repeatable and observable evidence of evolution occurring in real time. Not variation extrapolated to common descent. Not fruit flies remaining fruit flies, or bacteria remaining bacteria, or dogs remaining dogs, or cats continuing to be cats. My Leafs played so well last night and tonight lost to the Islanders. The Islanders! How embarrassing is that? Can you not read? I NEVER said "evolution is true because so many scientists believe it." NEVER. I said so many scientists accept ToE because of the quantity and quality of evidence. There's a REASON that it's the overwhelming scientific consensus. If you are going to keep misrepresenting what I say there's no use trying to have a discussion. Read. Ask questions. Learn. Or refuse and stay comfortably ignorant. Your call. Give me an alternate, better way to interpret it that is supported by the details. How about the papers written by scientists who do not accept evolution, do they not count for anything? What papers? In what professional peer-reviewed scientific journals can they be found? Having all our dating methods like C14 and radiometrics only go back 6000 years. Having dendrochronology only go back 6000 years. Having lake varves only go back 4500 years to Da Flood time. Having the fossil phylogenetic tree and DNA based one show discrete starting points indicating separate created lineages. Having all living species show signs of a severe genetic bottleneck 4500 years ago. Any of those things would falsify ToE in a second, but none have ever been found. Why is that? Going to accuse millions of scientists of deliberate fraud? We've got demonstrable, repeatable and observable evidence of evolutionary processes occurring in real time. I said no ridiculous demands like expecting to see 10 million years of evolution in a week. Would you demand that a geologist show you South America actually moving to touch Africa before you accept plate tectonics? And they lost Lupul for a good while too. Ouch! "I can't give you numbers because I don't keep track. Suffice it to say that over the last thirty or so years it would number in the hundreds. As for giving you names, why would I do that and why would you want them? Do you seriously think you would know all those people?" In other words, you can't support your claim. joey g should be along any minute now to give you a hard time for that. "The evidence supports the idea because of their predisposition to interpreting the data in that manner. Data is open to interpretation based on ones presuppositions. Your presupposition is that evolution is true and therefore you simply accept that all evidence points towards it. I don't presume evolution as true and therefore, I don't accept that all evidence is evidence for evolution." Yeah, because you're predisposed to believe in religious fairy tales. And you seem to have missed the fact that every scientist on Earth is aware of religious fairy tales (and it's likely safe to assume that a lot of them were brought up on them) yet most accept the ToE and other scientific tests/theories that support the ToE, such as radiometric dating, plate tectonics, etc. "Well we're making progress, now we're down to 97%. Still to high, but heading in the right direction." Too high? The exact percentage doesn't really matter since most scientists obviously do accept evolution and the ToE, and I seriously doubt that they would do so if the evidence and interpretations and explanations weren't convincing. There are disagreements between some scientists about the particulars of evolution and the ToE but the vast majority of total non-acceptance of evolution and the ToE is by religious zealots. "Why do you think that because a very large percentage of scientists are predisposed to evolution that evolution is therefore true?" Why do you think that one person or a large percentage of people believing in religious fairy tales makes them true? "The vast majority of today's scientists have throughout their entire education been told evolution is a fact. As a result I would be surprised if the vast majority didn't believe evolution to be true." All scientists on Earth have been 'told' that religious fairy tales are true or a "fact", and like I said above it's likely safe to assume that a lot of them were told that from their birth. "However, these numbers are meaningless in determining whether or not evolution is indeed true. You could have every person on the planet convinced of evolution's truth, but that would not make it in fact true." Yes, it's true that numbers don't matter, unless the numbers accept something based on evidence and a rational interpretation/explanation. And you could have every person on the planet convinced of the truth of religious beliefs but that would not make them, in fact, true. "If everyone on Earth was to believe the Sun revolved around the Earth, would the Sun then begin to revolve around the Earth? Truth is its own defence regardless of popular opinion." It's funny that you used the Sun orbiting the Earth example. And yeah, popular opinion doesn't establish that religious beliefs are true. You obviously think that most scientists are brainwashed from childhood on into accepting evolution and the ToE but you aren't willing to apply the same thinking to religious beliefs. "No one is saying they are delusional or misinformed. I have only claimed they are predisposed to interpreting the evidence in light of their presuppositions." Actually, you are saying that they're delusional or misinformed. Why can't you god pushers be honest? "As for plate tectonics, that is an observable and measurable phenomenon which has really nothing to do with evolutionary theory. Plate tectonics is not a problem within a design scenario." Plate tectonics does have something to do with evolutionary theory, especially in regard to the location/distribution of prehistoric and extant organisms and sediments. Of course plate tectonics is not a problem within a design scenario, because anything at all can be fit into a design scenario. An allegedly omnipotent, omniscient sky daddy designer can allegedly do anything. "You're a rather peculiar character. You like to come across as a very highly informed individual, but in reality your attitude comes across as that of a punk. You think you can hurl insults and issue demands and everyone should jump." Hmm, that's not a bad description of joey g.
We've got demonstrable, repeatable and observable evidence of evolutionary processes occurring in real time. Yup and we have no idea if those evolutionary processes are design processes or blind watchmaker processes. Not only that what we do observe in no way supports evolutionism. "Can you not read? I NEVER said "evolution is true because so many scientists believe it." NEVER. I said so many scientists accept ToE because of the quantity and quality of evidence. There's a REASON that it's the overwhelming scientific consensus." Yeah, I can read and I can also interpret what I read. Though you may have never used the phrase "evolution is true because so many scientists believe it. ", your appeal to majority opinion amounts to the same thing. So I have not misrepresented what you've said. I've got to get to work, so I'll answer the rest of your response later. I'm slowly getting back to my business after Cancer treatment and I'm trying to get myself back into a routine. Yeah, losing Lupul is going to hurt. Best to keep your eyes open when screening the goalie on a Phaneuf shot. No Nic, it doesn't amount to the same thing. Not even close. I have NEVER appealed to majority opinion. I have merely pointed out that there IS a vast majority opinion from qualified professionals, and given reasons for WHY it is the majority opinion. I have NEVER appealed to authority and said "you should believe ToE just because scientists do". Your self denial mechanisms are twisting my arguments beyond recognition. Just like saying "97% of all geologists accept plate tectonics" is NOT the same as "plate tectonics must be true because geologists say so." Take it easy with the recovery. One thing I learned especially as I got older is don't try to come back from injuries too fast or too soon. Does the rumor mill still have Luongo going to Toronto? No Nic, it doesn't amount to the same thing. Not even close. I have NEVER appealed to majority opinion. I have merely pointed out that there IS a vast majority opinion from qualified professionals, and given reasons for WHY it is the majority opinion." But mentioning the fact of majority opinions is meaningless unless you believe that it carries weight and is persuasive. Do you believe the fact a majority of scientists hold to evolution is a meaningful argument? "Take it easy with the recovery. One thing I learned especially as I got older is don't try to come back from injuries too fast or too soon." Thank you, I will. What I'm dealing with right now is a secondary issue to the cancer. The cancer is under control, but resulting nerve damage is limiting my abilities to work and be otherwise active. It is improving, but it is slow and frustrating. "Does the rumor mill still have Luongo going to Toronto?" Yes it does. Early rumours included Lupul, but that is now moot. Other rumours have included Kadri and Bozak. That would be a big mistake to let either of those guys go for an aging goalie who clearly wants to go to Florida. I think the public pressure affected Luongo in Vancouver. It would only be worse in Toronto. In Florida he can be virtually anonymous, which better suits his personality. He's an excellent goalie, but the public scrutiny he faces in Canada puts unwanted pressure on him and reduces his performance. "In other words, you can't support your claim." No, I simply don't want to supply names for a couple of reasons. One is that people expressed these opinions in confidence and I, unlike some others, respect that fact. The world of academia is not a place which is tolerant of dissent from popular opinion. Second, you strike me as the kind of character who, if he had names and found some way to contact these people, would begin to harass them. As I said before, you're delusional if you think there are not people who publicly toe the party line on evolution while privately expressing doubt or even outright disbelief. However, if it makes you feel good to deny their existence you go right ahead, it won't affect me in the slightest. As for Joe G, he knows I'm right, so I don't expect to hear from him on the subject. "Apply that to predisposed religious beliefs in general, and to christianity in particular." Everyone starts from a predisposed position, and those who adhere to religion are no different. Nic. Buddy. Read the words I write again. Slowly. Follow with your finger if it helps. I am not offering majority opinion as a persuasive or meaningful argument. I am not offering majority opinion as an argument AT ALL. I merely point it out as a simple fact, there IS an overwhelming majority opinion among people who study and work with the topic for a living, and am asking for your explanation WHY it is so. The best you can do is the meaningless assertion "they're predispositioned to believe" that is demonstrably false. Sure most have college level training in the subject, but they also all have first hand empirical experience with the evidence and how the theory brings the whole picture together. These people aren't stupid or deluded Nic. If what they saw in the lab and the field didn't match what they were taught it would be all over every news service on the planet. Again, you're the guy arguing that all pilots and aviation engineers are merely predispositioned to believe powered flight is possible to the guys who have actually built and flown powered planes. You keep asking for the evidence for ToE but that's impossible to do justice to in this tiny space. The subject covers 150+ years' of work in hundreds of different scientific disciplines and literally millions of research papers and documentation on the details. I can link you to introductory sites with a very high level overview, but we could spend years drilling into the details and barely scratch the surface. If you want we can pick a very specific topic and examine some scientific papers, but without more background I'm not sure what benefit it would provide for you. In one sense the evidence for ToE is like a giant jigsaw puzzle. There are millions of pieces, and any one piece by itself won't show you much. But there's only one coherent, consilient way to put all the pieces together, and when science did the picture of evolution of life on Earth over the last 3+ billion years became unmistakeable. When new pieces - new data - becomes available of course scientists see if it fits into the existing picture. So far every bit has. I can tell you're a reasonably sharp guy (except for the occasional lapse into mook-dom, and being a Leafs fan ;) ) but your problem is you don't know what you don't know. You are using your religiously-based misconceptions to fill in the blanks, and that doesn't help anyone. "I merely point it out as a simple fact, there IS an overwhelming majority opinion among people who study and work with the topic for a living, and am asking for your explanation WHY it is so." Sure it's a simple fact there is an 'overwhelming majority'. It's also a simple fact that overwhelming majorities mean nothing when determining the outcome of a question. As I said to velikovskys, ask the French at Agincourt, or the Zulus at Roarke's Drift how their overwhelming majorities worked out. As I've said before, 110% of people can believe something to be true. It matters not how much they believe it if it is in fact false. "These people aren't stupid or deluded Nic." Never said they were, I only said they presuppose the truth of evolution, which is simply a fact. They're convinced evolution is a fact and all data points to that fact. Does not the fact evolutionary theory is like a rubber band not affect you in any way? It matters not what data comes down the pike, it's made to fit the evolution paradigm. How long were we told the existence of 'junk DNA', supposedly the majority of our genome was left over from our evolutionary past and was thus proof of evolution? Now that it's known to have function after all, it is now argued this is what evolution predicted all along and its functionality is now proof of evolution. When it comes to evolution it's always 'heads I win, tails you lose'. "Again, you're the guy arguing that all pilots and aviation engineers are merely predispositioned to believe powered flight is possible to the guys who have actually built and flown powered planes." This has nothing at all to do with the subject at hand. Powered flight is an observable, demonstrable and repeatable phenomenon, evolution is not, so the comparison between the two is utter nonsense. "In one sense the evidence for ToE is like a giant jigsaw puzzle." Not a bad analogy at all. The evidence is like a giant jigsaw, and as the pieces come together it is showing a completely different picture than that of the assumptive evolutionary image on the box. "I can tell you're a reasonably sharp guy (except for the occasional lapse into mook-dom, and being a Leafs fan ;)"
Yes, I am a reasonably sharp guy and thank you for saying so. By the way, I am still waiting for my 'Mook of the Day Award'. I can understand if you wish to keep the actual trophy for presentation to other future winners, but you could at least send me a photo of it so I can put it on my desktop. I've earned it after all. As for being a Leafs fan, I do get a lot of sympathy. But I have been a Leafs fan all my life, as was my Father and my Grandfather. I may be a 'mook', but I am loyal. Sure it's a simple fact there is an 'overwhelming majority'. It's also a simple fact that overwhelming majorities mean nothing when determining the outcome of a question. I give up. You've made up your mind to deliberately misrepresent what I write and argue against your misrepresentation despite being corrected on it three times. It matters not what data comes down the pike, it's made to fit the evolution paradigm. Another falsehood spoken from ignorance. I already gave you a number of things that would falsify the current ToE is an instant. But none of those discoveries have been made. You seem to be another Creationist who doesn't know the difference between not falsifiable and not falsified. BTW Nic, ALL scientific theories are open to revision and modification when new evidence becomes available. That's how science works. So claiming ToE is a 'rubber band' is really quite silly. But the picture wasn't assumed beforehand. The picture was empirically determine by the evidence. All the Creationist hand-waving revisionist history won't change that. What a wonderful tradition to pass down between generations. "I give up. You've made up your mind to deliberately misrepresent what I write and argue against your misrepresentation despite being corrected on it three times." If you do not believe that the fact a vast majority of scientists accepting evolution as a fact is a sound argument, why use it? To simply say you're doing so because there must be some reason they come to this conclusion does not lessen your reliance on it as an argument you see as working in your favour. I really don't see how I'm misrepresenting your position and I'm sorry you feel that way. "BTW Nic, ALL scientific theories are open to revision and modification when new evidence becomes available. That's how science works." I'm well aware of that. However, there is a difference between revision and straightforward reversal. And reversal is exactly what has happened with the junk DNA situation. "But the picture wasn't assumed beforehand." I wholeheartedly disagree. The picture very much was assumed beforehand. The only question was in what style would it be painted, Picasso or Rembrandt. But whether or not evolution occurred? No question at all. And it is this predetermined outcome which has derailed science over the last 150+ years. ID or creation have not been the science stoppers as so many like to say, evolutionary thinking has, with its unwavering commitment to 'naturalistic' origins of life. "Of course plate tectonics is not a problem within a design scenario, because anything at all can be fit into a design scenario. An allegedly omnipotent, omniscient sky daddy designer can allegedly do anything." If you knew even a little bit about the design position, you would know this is a preposterous statement. But as it seems you spend very little effort trying to find out the truth, it doesn't surprise me you would not understand how plate tectonics create no problem for design scenarios. Perhaps you should change your name from 'the whole truth' to 'my perception of truth'. There is a HUGE difference between "this is true because most scientists accept it" and "most scientists accept it because the evidence shows it is true". I keep arguing the latter, you keep accusing me of the former. If your grasp of logic is so poor you can't see the difference I feel sorry for you. There was no reversal of position at all in the scientific community. The position went from "we don't know of any function for most non-coding DNA" to "we now know of some function for some non-coding DNA." How is that a reversal? Evolutionary biologists did the work, evolutionary biologists made the discovery, evolutionary biologists published the results. How does that tie in with your "all evidence against ToE is automatically rejected" claim? I wholeheartedly disagree. The picture very much was assumed beforehand. 100% unadulterated bullcrap. Show me anywhere in the time before Darwin that the scientific establishment said "OK guys, we need to come up with a way to overthrow religion. Get to work on a new theory that doesn't require miracles from the Christian God". I guarantee you can't. But whether or not evolution occurred? No question at all. There's no question NOW because we have 150+ years of supporting evidence. There was great question and opposition when OOS was first published. Look up the famous 1860 Oxford evolution debate with the well known encounter between Bishop Wilberforce and T.H.Huxley. The first supporters of ToE had to prove their case to the scientific community, and by preponderance of evidence they did. There's been no 150 year secret conspiracy to push an unsupported idea. The evidence won out as it always does. You can make up all the revisionist history you want Nic, but the facts don't support you. Sharks off to 4-0 start. Patty Marleau 8 goals in 4 games, Joe Thornton 11 points. Pity West won't play East till the finals this season. F*** you Gary Bettman. If you knew even a little bit about the design position, you would know this is a preposterous statement. Why is it preposterous Nic? Please give an example of something that would be a problem for a design scenario, and why it would be a problem. "How long were we told the existence of 'junk DNA', supposedly the majority of our genome was left over from our evolutionary past and was thus proof of evolution? Now that it's known to have function after all, it is now argued this is what evolution predicted all along and its functionality is now proof of evolution." Name the scientists who are now arguing that "evolution" predicted all along that junk DNA would be found to have "function" and "its functionality is now proof of evolution". And then work your way through newer posts about Encode and junk DNA on Sandwalk. There are a bunch of posts and accompanying comments. Ian, how many levels of information would make it too difficult for you to accept that it was all produced by purely natural processes, unguided by any intelligence? How few to convince you? tokyojim, do "levels of information" equate to mere complexity, specified complexity, irreducible complexity, or some other kind of complexity? I wouldn't want joey g to get confused. So-called "levels of information" aren't what will verify a divine, supernatural designer-god and especially a particular divine, supernatural designer-god. To verify a god or a particular god it will take scientific evidence of a god or a particular god. If you have any, please present it. "God" may be the default in religion but it isn't in science. It could be said that computers, books, libraries, newspapers, magazines, the internet, etc., have many "levels of information" but few if any people would claim that any or all of that stuff was designed and created by a designer-god. ID doesn't care who the designer was. ID just cares that the evidence says there was a designer. I see it still upsets you because there isn't any evidence to support the blind watchmaker. "It could be said that computers, books, libraries, newspapers, magazines, the internet, etc., have many "levels of information" but few if any people would claim that any or all of that stuff was designed and created by a designer-god." And absolutely nobody would claim 'that stuff' was not designed and created itself. "ID doesn't care who the designer was. ID just cares that the evidence says there was a designer." 1. The first sentence is a lie. The 'designer' is alleged to be "God". 2. You and the rest of the IDiots expect and demand that 'evolutionists' prove every nitpicking step/process/event right back to the beginning of time and that they predict every nitpicking step/process/event through the end of time, but for some reason it's supposed to be just fine that you IDiots stop at 'it looks designed to me'. Your double standards are massive, joey. "So-called "levels of information" aren't what will verify a divine, supernatural designer-god and especially a particular divine, supernatural designer-god. To verify a god or a particular god it will take scientific evidence of a god or a particular god. If you have any, please present it. "God" may be the default in religion but it isn't in science." I agree with you. Science will never be able to verify God because He is outside of the realm of science. Science can say nothing about this supernatural, but it can provide evidence for His existence. No, God is not the default in science, "G-a-w-d" as Thornton likes to say is, only you guys spell it "M-A-T-E-R-I-A-L-I-S-T-I-C E-V-O-L-U-T-I-O-N"
And yet, this is the materialist's claim when it comes to far more complex and information rich things. Now you know why we believe in an Intelligent Designer! "Science can say nothing about this supernatural, but it can provide evidence for His existence." Exactly how can science provide evidence for "His" existence? "And yet, this is the materialist's claim when it comes to far more complex and information rich things." 1. The first sentence is a lie. The 'designer' is alleged to be "God". Nope. Just because some IDists say that doesn't mean anything to ID. Again you think that YOUR ignorance means something- strange. Look, moron, you and your ilk say that you have a step-by-step gradual processes for producing biological systems and subsytems. Therefor it is up to you to demonstrate that. Don't blame us because you cannot support your claims. Also, unlike you, we actually have a methodology for determining design or not. Again your ignorance means nothing. "...we actually have a methodology for determining design or not." Support that claim and all your others to at least the same extent that you expect and demand from 'evolutionists'. You've claimed many times that "ID is all about origins", so support your claims by much more than an "inference". Do what you expect and demand from 'evolutionists' by producing scientifically testable evidence of the step by step process of design all the way back to the ultimate 'origin', and produce a detailed, comprehensive, scientific theory that explains all of the evidence. Be sure to include and cover the origin and all 'functions' of the universe, gravity, star and planet formation, time, life and its diversity, extinctions, intelligence and lack thereof, thermodynamics/entropy, and absolutely everything else in and of the entire universe. After all, you claim that ID posits that the entire universe was designed and you claim that everything that originates from design is a designed result. Of course those claims destroy your other claim that you have "a methodology for determining design or not". If the entire universe was designed, which you claim, then everything in and of the universe was designed to occur/exist, therefor nothing in and of the universe could NOT be designed. And since "ID is all about origins", you must produce scientifically testable evidence and a detailed, comprehensive, scientific theory of the origin of the alleged 'designer' and all of its antecedents. Get busy, joey. Sure you do. The methodology is "compare the unknown to something that is already known to be designed, see how closely they match". Sadly for you ID-Creationists, you have no known examples of designed natural life, no before-the-fact specifications to compare against. Which means all you've got is empty bluster. LoL! TWiT you don't know anything about science. I am surprised that you can spell it. Do you really think that your ignorance means something? Really? Nope. Keep fishing you ignorant puke. I see all you have is empty bluster. Dembski listed around forty different definitions of information and complexity. Which, if any, are you referring to when you talk about information? I should say that I don't think information is a property of the genome, rather it is a property of our models of the genome. To quote an analogy I've used before, consider tree-rings. If I look at a cross-section cut through thr trunk of a tree I will see concentric rings of lighter and darker wood. I know that they indicate different rates of growth but that's about all. A dendrochronologist, on the other hand, might look at those same rings and infer a great deal about the history of the plant and the environment in which it grew. Same tree, different information. So, is the information in the tree or does it describe what is produced when data gathered from observation of the tree is fed into the model of trees that already exists in the mind of the dendrochronologist? Dembski listed around forty different definitions of information and complexity. I understand what you're trying to accomplish with this example, but I'm afraid you're equivocating. The information contained within a program such as the genetic code of the tree, is not the same type of information which can be gleaned from studying the growth rings of that tree. My argument is that it is misleading to say that what is contained in the genome is information because it implies that it is the same as what most people think of as information when it's not. Something else that influences a proteins final form- timing. As in the timing of the tRNAs arrival. If the tRNA is late that effects the final form. That is what makes so-called "silent mutations" not so silent. "You and the rest of the IDiots expect and demand that 'evolutionists' prove every nitpicking step/process/event right back to the beginning of time and that they predict every nitpicking step/process/event through the end of time, but for some reason it's supposed to be just fine that you IDiots stop at 'it looks designed to me'." Given the fact that you assert it all happened by chance in spite of the clear evidence of design as this article further enunciates, it seems to me the onus is on your side to show that it really can happen by random natural processes. We cannot prove who the designer is, or even that it is designed, but the evidence is sure stacked in our favor and as far as potential candidates for the designer, most of us believe it is the God of the Bible, but that is a position of faith. In the end, since there can be proof for neither side, we both end up taking our position by faith based on our interpretation of the evidence we do have. I think the designer paradigm has far more explanatory power for the evidence that we have. "We cannot prove who the designer is, or even that it is designed, but the evidence is sure stacked in our favor and as far as potential candidates for the designer, most of us believe it is the God of the Bible, but that is a position of faith." "Given the fact that you assert it all happened by chance..."
I don't recall that I've ever asserted that in my entire life. Your position asserts that. Nice to see that you are just ignorant of everything. I don't see that it has any explanatory power at all. All that ID does is to posit that an intelligent agent of unknown nature and powers is behind the appearance of design in Nature. That's all. The rest is about trying to use probability theory to show that structures that appear designed could not have come about any other way. That and the argument from incredulity: since we cannot imagine any naturalistic way the Universe could have come about, it must have been created. What is my "position", joey? Evolutionist, You Are the Man!